You can pick up the Bound Folio from Amazon here. The world is full of heroes, villains, and all the shades in between. The Bound Folio tells their stories from the tortured childhood of the legendary Blademaster the Sword of the North, to the humble origins of the Queen of the Five Kingdoms, to the death of one of the world’s greatest assassins. 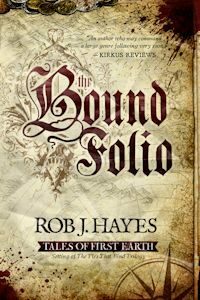 This anthology collects together eight dark stories of swords, sorcery, and seduction from First Earth, the setting of The Ties That Bind trilogy and the Best Laid Plans duology. Black Blood – Read for free by clicking here. Between devious pirates, walking skeletons, and an ancient treasure map; Arbiter Beck’s mission in the Pirate Isles will just have to wait. When Derran Fowl’s father requests a witch hunter to exorcise his daughter, Derran’s whole world comes crashing down around him. Alfer Boharn was once the most famous assassin in the world, but those days are behind him now. Unfortunately, the past has a way of catching up with folk. Growing up in Korral is a hard life where friends are just enemies waiting for a reason. The Kid is about to find his reason. The Five Kingdoms war against the dead never ends and squire Tristan Southerland is about to get his first taste of it. After the suspicious death of his father, Sirion Tell returns to Truridge to take up the family business, only to find out just how dangerous the merchants of Truridge can be. Lorri and Ehln are guilty of no other crime than existing, yet it’s enough to see them chased to the ends of First Earth and back. Before she became Queen of the Five Kingdoms, Shián Crowfeather was the only student ever to be expelled from the school of mistresses.